On Monday I spoke with Effie Eitam, MK, following his meeting with the foreign ministers of Jordan and Egypt in Jerusalem. They were there to encourage further Israeli consideration of the Saudi-initiated peace proposal. Eitam, in return, presented a proposal of his own relative to cooperation between Israel, Egypt and Jordan. The full text of the interview can be found here. Several significant events occurred in the Middle East while I took a short break from blogging for a family vacation. I’ll comment on several items as I catch up in the next few days. Shimon Peres became Israel’s President on July 15. I have hopes that his dovish stance on Palestinian relations will pay dividends during his tenure. Michael Bar-Zohar’s biography published in English in February shows all sides of the hawk turned dove. 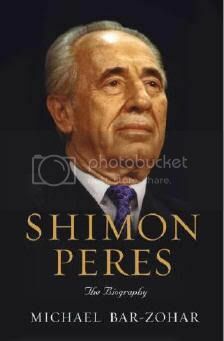 (see Peres’ own comments on the change in his views in my interview with him. The Peres Center for Peace, under the presidency of Oslo peace negotiator Uri Savir, has attracted wide support (former Palestinian PM Ahmed Qurie is an international board member). In June it held a conference in Tuscany which brought together delegates from more than 100 Palestinian and Israeli organizations and about 60 European agencies. Meanwhile Peres assumed another new role, as president of a new organization pan-Jewish organization to represent Israeli and Diaspora Jews around the world. Former US peace negotiator Dennis Ross publicly invited Peres to take up the role at a meeting in Jerusalem recently.